Where the Holy Spirit lives, human character is changed and spiritual fruit can be seen. Certainly this maturity isn't found overnight! It is, however, noticeable over the long haul of life. 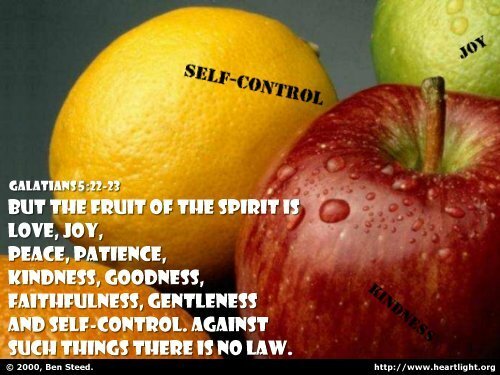 What fruit is the Spirit bearing in your life? In what ways have you matured? In what areas do you want the Spirit to exercise greater control? Why not take a moment and consciously yield those areas in which you struggle to him now, as you pray? Almighty and ever-present Father, thank you for empowering positive changes in my life as I seek to be more like Jesus. Please bring to full maturity the fruit the Holy Spirit is growing in my life. You know very well that I continue to struggle with __ in my life. I intentionally turn over that part of my life to your Spirit to redeem and fully sanctify. In Jesus' name I pray. Amen.